The prediction for jewelry was emeralds… but where were they at the Oscars? 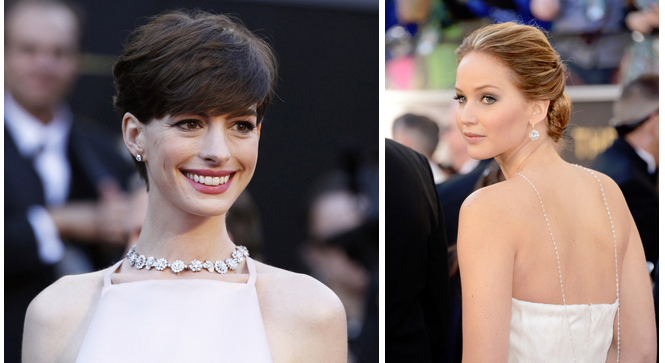 The most talked about gowns and jewelry of the evening were worn by Oscar winners, Jennifer Lawrence and Anne Hathaway. While receiving her Oscar, Jennifer accidentally tripped on her long flowing white Dior Couture gown going on stage. Her lovely sparkling Chopard necklace, draped around her neck and fell down her backside, giving it a striking and elegant look. Anne’s necklace was quite amazing as well, as it had flower like designs of various shapes that also trickled elegantly down her back. Her jewelry was by Tiffany & Co. and was worth $485,000. Anne informed one of the E! Entertainment hosts that she picked out her Prada dress, just 3 hours before the event! Also, Charlize Theron and Naomi Watts looked smashing in their modern gowns. Charlize was wearing a white Dior Couture gown and diamond jewelry by Harry Winston. Her bracelet had diamonds totaling over 100 carats. Naomi was wearing an amazing gunmetal metallic Georgio Armani Prive gown with drop earrings with 20-carat platinum and diamond drop earrings, and a platinum and diamond bracelet ($1.5 million total). Which celebrity’s jewelry did you love the most? Post them in your comments below! This entry was posted in Celebrity Jewelry, Diamonds, Jewelry, Jewelry Brands, Jewelry Guides, Jewelry History, Jewelry Metals, Jewelry News and tagged academy awards, anne hathaway, charlize theron, diamonds, dior, harry winston, jennifer garner, jennifer lawrence, Jewelry, naomi watts, oscars, oscars 2013, tiffany. Bookmark the permalink.